The oddly shaped Pencil Nebula (NGC 2736) is pictured in this image from the European Southern Observatory's La Silla Observatory in Chile. The image was released on Sept. 12, 2012. 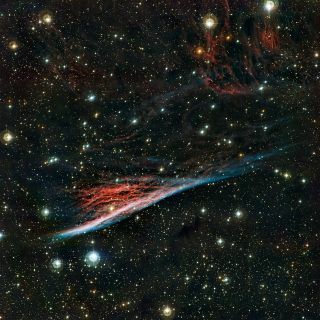 A telescope in Chile has snapped a stunning new image of a speedy nebula that is named after a writing tool, but has a closer resemblance to a witch's broom, scientists say. Astronomers with the European Southern Observatory took the new view of the Pencil nebula using the La Silla Observatory in Chile's high Atacama Desert. The nebula contains the remains of a colossal supernova explosion centuries ago that blasted gas and dust into interstellar space. "These glowing filaments were created by the violent death of a star that took place about 11 000 years ago," ESO officials said in an image announcement today (Sept. 12). "The brightest part resembles a pencil; hence the name, but the whole structure looks rather more like a traditional witch's broom." The Pencil nebula, also known as NGC 2736, is about 800 light-years from Earth and moving at a clip of about 403,891 mph (650,000 kph). It is the brightest part of a vast expanding shell of gas in the constellation Vela (The Sails) that is known as the Vela supernova remnant. The remnant was originally hurtling through space at millions of miles an hour and much brighter, but it has cooled and slowed over time, ESO officials said. In the new ESO photo, the Pencil nebula's wispy gas filaments appear as ripples of light dotted with brighter knots. The nebula gets its brightness from dense pockets of gas that were struck by the supernova shockwave, ESO officials said. Bright blue colors in the image are hot regions of ionized oxygen, while the duller red portions highlight warm hydrogen, they added. This image of the region of sky around the Pencil Nebula shows a spectacular celestial landscape featuring the blue filaments of the Vela supernova remnant, the red glow of clouds of hydrogen and countless stars. Released on Sept. 12, 2012. By studying the different hues of the Pencil nebula, astronomers are able to map the object's temperature ranges. The nebula itself measures about 0.75 light-years across. One light-year is the distance light travels in a single year, about 6 trillion miles (10 trillion kilometers). The Pencil nebula was first discovered in 1835 by astronomer John Herschel, who described the nebula as "an extraordinary long narrow ray of excessively feeble light," ESO officials said. Because of that, it was sometimes referred to as "Herschel's Ray," they added.